Sadly, the circa 1820s "Lawrenceville log house" was demolished in late July, 2011. It stood in the 100 block of 38th Street. 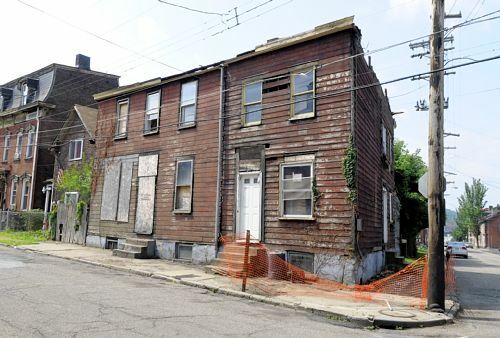 The house was constructed of logs and was believed to be the oldest surviving building in the Lawrenceville neighborhood of Pittsburgh. The logs were numbered and hopefully the building will be re-built. This building was definitely not Stephen Foster's family home. For information on that house, see the book A Doughboy's Tale . . . and More Lawrenceville Stories. As an active member of the group, I know that the Lawrenceville Historical Society did everything within its power to save the building, but there was simply not enough financial support from the public to achieve this goal. In response to Brenda Jean's comment of September 16, 2011, Mike Gwin, an architect who has had previous experience with saving log houses, was working on the project and told the group that the building was in such bad shape it would have to be taken apart and resurrected log by log to make it safe. The LHS's goal was to turn the building into a neighborhood museum. The estimates ranged into the hundreds of thousands of dollars. It is a shame that people let their properties deteriorate to such a state. In regards to this particular house, the research was done, but without financial support the building could not be saved on its original site. We can only hope that the party that purchased the logs will be rebuild the house and treat it better than the previous owners did.